Most Americans are aware that the U.S. economy and markets are more frequently and deeply affected by global developments than was the case even a generation ago. 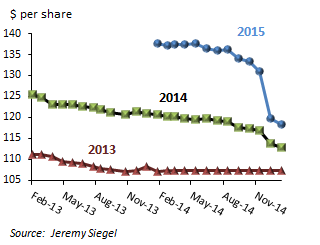 Yet when global shocks occur they still somehow manage to be a bit of a surprise. Over the past two months the United States has been rocked by two shocks that have been global in scope: The sharp rise in the dollar, and the equally sharp fall in oil prices. Neither event, of course, is necessarily unwelcome. A strong dollar means imported goods and vacations abroad are cheaper, and lower energy prices have the same effect on consumers' spending capacity as a tax cut. But the shocks may complicate economic policymaking in coming quarters, and is likely to require a bigger adjustment on the part of producers and exporters than they had anticipated. 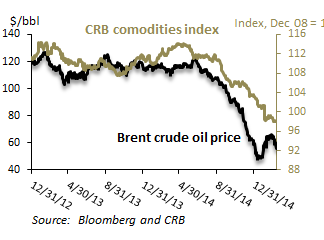 Both the rise in the dollar and the fall in oil prices, of course, are partially domestic in origin. The stronger dollar is the result of monetary policies in the United States that are out of synch with those in Japan and Europe. The Fed began quantitative easing (QE) " the provision of massive amounts of liquidity to the financial system through large-scale bond purchases " at the peak of the financial crisis in November 2008. After three QE programs that resulted in $4.5 trillion in asset acquisitions, the Fed concluded that the U.S. economy no longer needed the support of extraordinary monetary stimulus and began tapering its bond purchases in February 2014. It halted the purchases altogether in October. 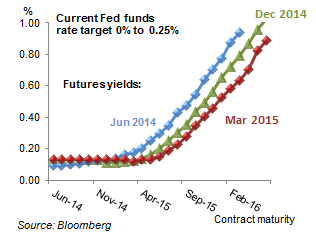 Now the Fed is preparing the ground for its first Fed funds rate hike since summer of 2006. Japan and Europe, whose economies have alternated between tepid growth and recession since 2008, began their QE programs much later. Japan's experiment with QE began after the election of Prime Minister ShinzÅ쳌 Abe in late 2012; the European Central Bank (ECB) launched its QE program in January 2014. Both the Bank of Japan (BoJ) and the ECB are seeking to avoid price deflation and meet their official 2% inflation targets. With the Fed no longer easing and the BoJ and ECB still buying massive quantities of bonds, long-term rates have diverged across regions (Exhibit 1). Once the ECB started charging banks for their deposits, nominal yields on German government bonds fell sharply, and have turned negative up to maturities of seven years. 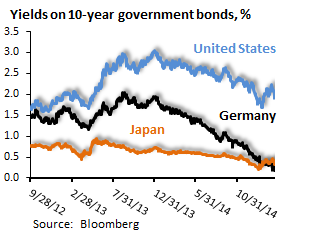 Yields on Japanese government bonds, which have been one percent or lower for years, have stayed low. The result has been a flow of capital into U.S. dollar-denominated assets, including U.S. Treasury bonds, that has driven up the value of the U.S. dollar sharply relative to the yen and the euro. The plunge in oil prices, meanwhile, can be likened to a trifecta: It is the combination of weak global demand " especially in developing countries, the increase in supply from shale oil production in the United States, and OPEC's decision to not cut production. The consensus among analysts is that oil prices will recover by the end of this year to the $70-$80 per barrel range once production cuts in the United States start in earnest. That bounce-back in prices, however, is not a foregone conclusion. The fall in oil prices has led analysts to re-examine their earnings estimates for energy companies, but it is the rise in the dollar that has led to the biggest revisions. Companies in several sectors now obtain a large portion of their revenues from overseas sales; for the energy, information technology, health care, and materials sectors it is over 50%. A stronger dollar can affect stock prices in two ways. 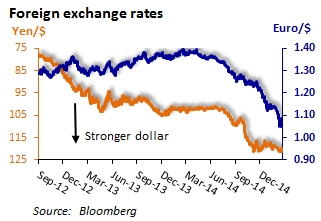 First, it translates into a lower value for revenues earned in foreign currencies. This translation effect is normally small because multinational companies are skilled at hedging and typically operate and fund themselves in a variety of currencies, such that gains in some currencies offset losses in others. Anecdotally, however, the speed at which the yen and euro " and some emerging market currencies as well "declined relative to the dollar this time caught many firms off guard. Second, a strong dollar can have a potentially much larger impact on corporate earnings in that it reduces the competitiveness of exports sold abroad. This effect typically takes longer to play out. Analysts likely differ in how they sort out these two effects, but the result is clear: Analysts expect large-cap U.S. companies to show their largest quarterly decline in earnings in 1Q 2015 since 2009. About the time the dollar began its sustained rise on a trade-weighted basis last fall the market began differentiating among U.S. companies based on their exposure to a higher dollar. 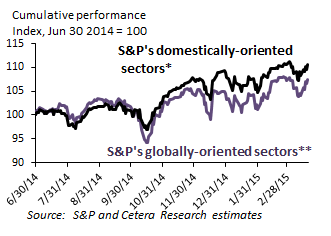 Since last fall the more globally-oriented sectors of the S&P 500 (those obtaining over 50% of their revenues from abroad) have underperformed the more domestically-oriented sectors. Other things being equal, in coming months investor sensitivity to overseas exposure is likely to work in favor of small-cap U.S. companies, which tend to sell less abroad. The rise in the dollar and fall in oil prices has already had an impact on Fed policymaking, and is likely to in coming months as well. At its March 17-18 meeting the Federal Open Market Committee (the Fed's policymaking body) took out language in its statement stating that it would be patient 쳌 regarding the pace at which it would normalize interest rates. But the members of the FOMC at the same time reduced their forecasts for future economic activity. 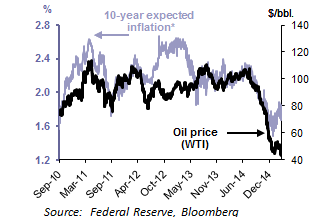 The market interpreted this as evidence that the stronger dollar and low inflation expectations " which are greatly conditioned by oil price movements " have given the FOMC some leeway in the timing of its first rate hike since 2006. The Fed funds futures market sees some probability of a rate hike in June, but a greater probability that the FOMC will hold off until September. Overall, the futures market has been skeptical of the Fed's hints that it would normalize interest rates rapidly, and has been pushing out the date of any rate hikes for the past year. The market has apparently seen more weakness in the economy than the Fed. Despite the recent turmoil in foreign exchange and commodity markets, forecasters remain fairly upbeat about the prospects for the global economy. 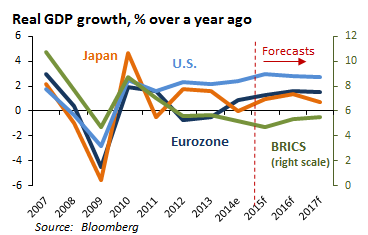 Last year Europe barely grew at all and Japan was in recession. But the consensus among economists is that economic activity in both regions will pick up in response to the QE undertaken by their central banks. The United States, despite a much slower-than-usual recovery from the last recession, has been the fastest growing economy in the developed world. The consensus believes that will continue. In general, we concur with the consensus " while acknowledging that the economy and the markets face substantial downside risks. This view is based on a positive outlook for consumer spending, which has picked up in the past two years and stands to benefit from lower gasoline prices, and business investment, which has lagged in this recovery but is growing at twice the pace of the rest of the economy nonetheless. 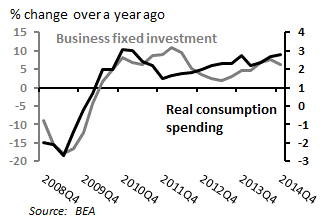 Residential investment has shown signs of softness as of late, but should recover before long. 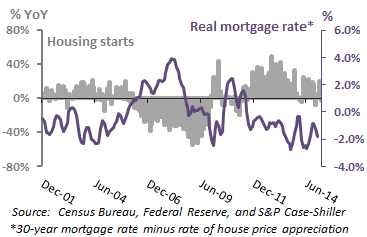 Low nominal mortgage rates and rising house prices mean that the real interest rate that homeowners face is negative " something that has stimulated housing starts and sales in the past. One sector that has not been a source of stimulus to the economy, meanwhile, has at least ceased to be a drag on GDP growth: government. 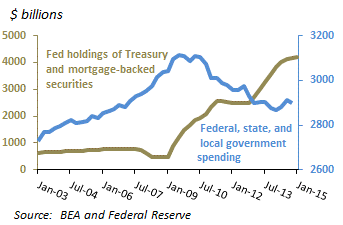 Total government spending, defined as Federal plus state and local government expenditures, declined from 3Q 2009 through 1Q 2014, but has since stabilized. The lack of stimulus from government spending was one reason the Fed engaged in quantitative easing; that rationale for continuing to provide the economy with extraordinary monetary stimulus is now gone. The risks to this outlook are that several of the factors that have deterred global growth in recent years could once again come into play. Europe and Japan could slip into deflation (though QE makes this unlikely) and their weakness could constrain growth elsewhere in the world, especially in the emerging markets. The effects of the strong dollar and weak commodity prices could also be more deflationary than the consensus expects, and U.S. growth could disappoint yet again. Finally, renewed disagreements about fiscal policy in an increasingly polarized Washington could once again lead to a return of market volatility. While these risks cannot be ruled out, they are not our baseline case for how events will unfold. For some time now our main investment thesis has been to expect moderate growth in the United States " better than elsewhere in the developed world " and an eventual normalization of interest rates. We see no reason to depart from this view, though the outlook for the rest of the world is brighter today than in years past. In light of these views we continue to favor U.S. stocks over international stocks. Within the United States we favor more domestically-oriented companies, which for us means increasing the allocation modestly to small-cap stocks. The growing likelihood of Fed rate hikes means we recommend keeping duration short and favoring corporate bonds over U.S. Treasuries " a stance that should minimize the pain of higher interest rates. Finally, as always we recognize the virtue of diversification, and continue to believe that alternatives provide an attractive vehicle for mitigating unforeseen volatility. Through those firms, Cetera Financial Group offers the stability of a large and well-capitalized broker-dealer and registered investment adviser, while serving independent and institutions-based financial advisors in a way that is customized to their individual needs. Cetera Financial Group is committed to helping advisors grow their businesses and strengthen their relationships with their investor clients. All of Cetera Financial Group's broker-dealer firms are members of FINRA/SIPC. For more information, visit cetera.com.